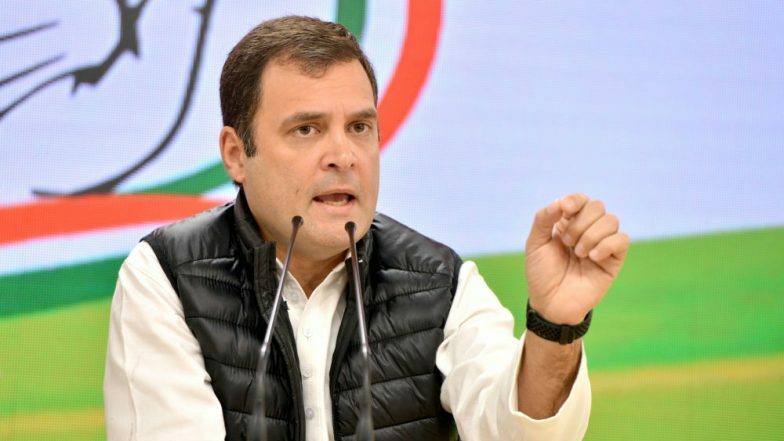 Rae Bareli, April 11: Congress President Rahul Gandhi on Thursday made it clear that he doesn't attach much importance to Prime Minister Narendra Modi's threats of putting Congress leaders behind bars if voted to power for the next five years. Modi is "not invincible" and it will become clear after the Lok Sabha elections, Gandhi told reporters here after his mother and UPA chairperson Sonia Gandhi filed her nomination papers from the Rae Bareli parliamentary constituency in Uttar Pradesh. Replying to questions about allegations of corruption brought against the Congress, Rahul Gandhi said: "I am perfectly happy if Modi wants to take any action against me." The Congress chief said there have been many instances in the past when people who thought they were invincible but history proved them wrong. "His invincibility will be in full view after the Lok Sabha polls," Rahul Gandhi said. He added that Modi should instead answer a few questions and reiterated his dare for a debate on the Rafale deal. Sonia Gandhi Files Nomination From Raebareli in Uttar Pradesh For Lok Sabha Elections 2019, Says Narendra Modi Not Invincible. "The day he holds a debate with me, he will not be able to look the people in the eyes anymore. Everything will become clear," Gandhi said. Referring to Wednesday's developments in the Supreme Court on the Rafale issue, he said it was for the Prime Minister to respond on why the top court "has started investigation" into the matter. The Supreme Court in an unanimous judgment on Wednesday rejected the preliminary objections raised by the central government and as a result, the apex court will hear the Rafale review petitions on merits. The top court will also look into the published documents, which the Centre had objected to earlier. Modi had on Wednesday accused the Congress of stealing money meant "for the poor and pregnant women" in the country, terming it as "Tughlaq Road election scam". The official residence of Rahul Gandhi is on Tughlak Lane in New Delhi.